After many years of rigorous education and, more importanly, diverse clinical practice, Dr. Irena Vaksman, a San Francisco dentist, truly understands the value of quality patient care – and how to provide it. Adhering to the principles of conservative dentistry, she continually stresses the importance of treating less patients per day, and spending more time with each one. This allows her to effectively educate patients about preventative dental health or, if medically necessary, about treatment options for an existing condition. 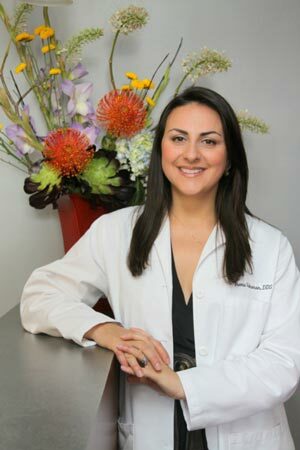 In addition to graduating New York University School of Dentistry’s prestigious Advanced Education in General Residency program, Dr. Vaksman has many years of extensive expertise in both clinical and cosmetic practices, as well as serving as a restorative dentistry instructor at University of the Pacific School of Dentistry. Dr. Vaksman stays on the forefront of cosmetic and preventative dentistry through advanced continuing dental education, and is also committed to keeping the San Francisco dental office “green-friendly” through such things as: computerized X-rays (to minimize radiation exposure and eliminate film processing chemicals), sanitized and filtered water, and a mercury-free policy. Most importantly, Dr. Vaksman has devoted her career to treating all of her patients with the greatest care, and providing each patient with the best quality treatment. She also believes in giving back to her community by contributing time and resources to several charitable organizations. She is a local board member of Smiles For a Lifetime, a national organization devoted to providing free orthodontic dental care to underprivileged kids; and is also a committee member of the Jewish Family & Children’s Services, where she helps to organize community outreach programs. The office also participates in Operation Gratitude by helping to gather care packages, which are meant to show our appreciation to our troops with the aim of lifting morale. Dr. Vaksman is a true Bay Area local, having attended grade school through university here. She and her husband are the proud parents of three beautiful boys, Charlie, Jack and Ethan.